ModCloth Treat Yourself Sale – 100s of Items 50% Off! 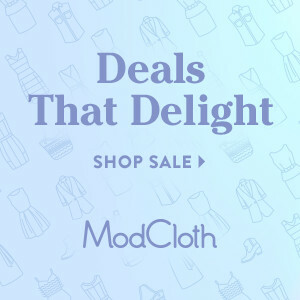 Hey ModCloth fans – this is the sale you have been waiting for! If you didn’t necessarily get what you wanted for Christmas, now is your time to grab what you DO want in the ModCloth Treat Yourself Sale. They have hundreds of items all at 50% off!! This entry was posted in Fashion on December 27, 2013 by Chrysa.